I’ve been posting my stats sporadically and the lack of consistency is killing me. 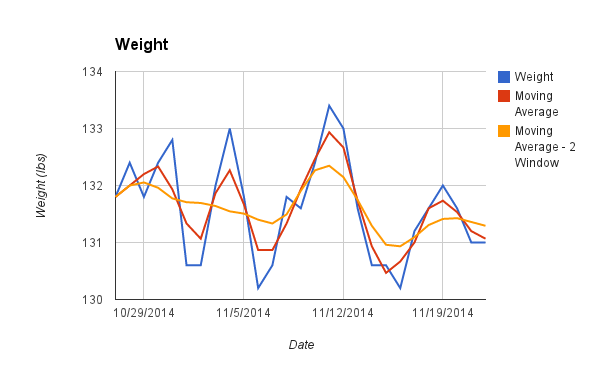 Like – you’ve seen my Fitbit steps for one week in October and a non-abutting span of 2 weeks in November. You (and by you, I mean I) can’t see progress looking at varying time intervals. So, I figured I’ll do a monthly recap. 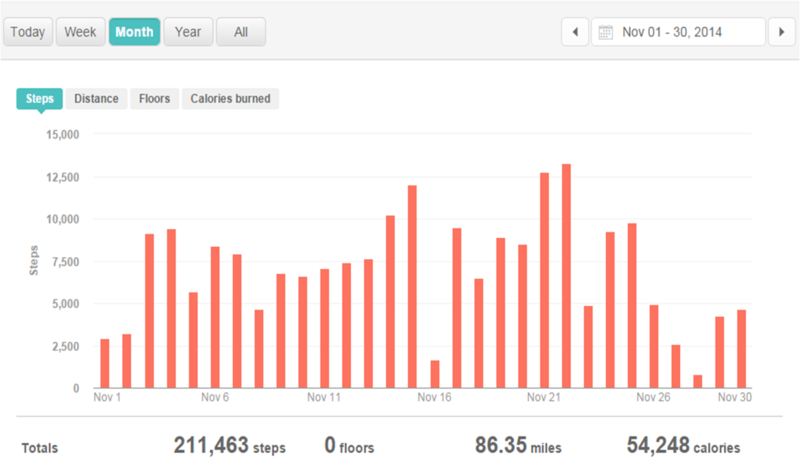 Average Daily Steps: 7,049 — Traveling to the suburbs for Thanksgiving killed me. I walked 784 steps on Black Friday. I’m a huge weirdo and weigh myself every day. I know you’re not supposed to because of the massive fluctuations (see blue line below), but I like knowing how much it can fluctuate, so I never feel bad about it. I’ve definitely plateaued and I’ll be working on that this month, but the overall trend is down (and I clocked in today at 129.8, and I’m not even dehydrated, so woohoo). As you can see I plotted the moving average twice with a window of 1 (average of 3 days) and a window of 2 (average of 5 days) because it smooths out the fluctuations, so that you can see the overall trend. I started running outside last week, as well. Per my physical therapist, I’m only supposed to do run/walk intervals for short periods of time to start, so none of this is very impressive – just very exciting! It’s such a weight off my shoulders to run without limping the next day. I just hope it holds up as I increase distance and speed. That’s all for today! I’ll be aiming to improve on all of these for December. On one hand I have a few weeks off from school, which will help, but Christmas parties, baking, and travel might offset that. 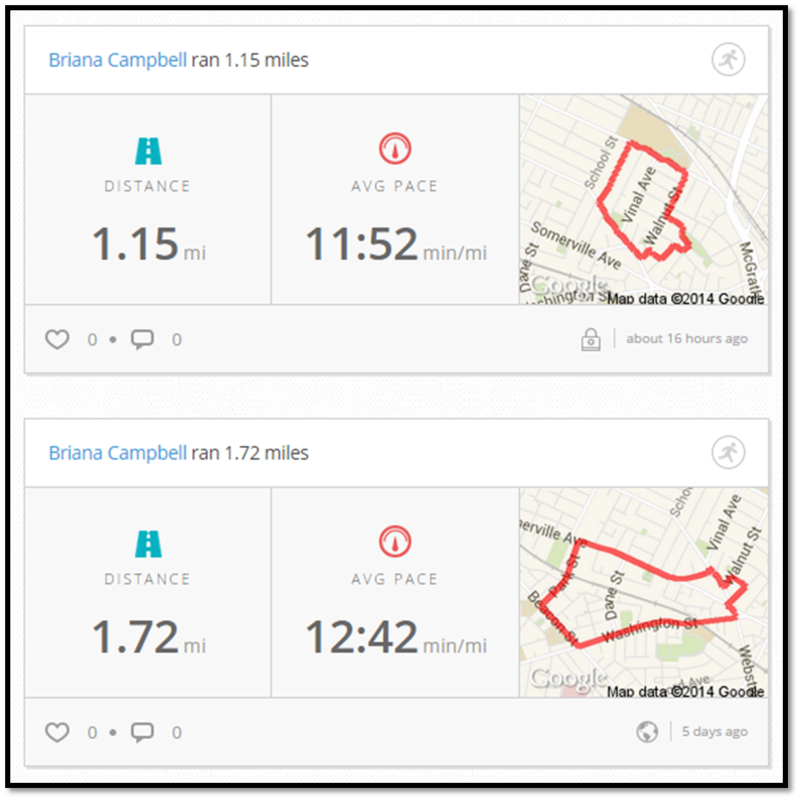 This entry was posted in Fitness and tagged exercise, fitness, gym, running, weight loss, workout wednesday. Bookmark the permalink.